Gold nails are one of the classics in nail polish colors. While too much gold fabric or metallic gold can be considered tacky and overdone, the color gold translates well as a nail polish color. As a color, gold symbolizes success, material wealth, and extravagance. On nails, gold polish gives off “strong woman” vibes similar to red. 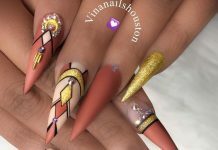 Unlike red nail designs though which are fiery in their passion, the color gold exudes confidence, prestige, and success. There are many types of gold nail polish ranging from glittery to metallic to matte. 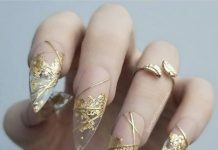 Thus, it’s not unusual to see gold on gold nail art designs such as those you will see in our collection below. 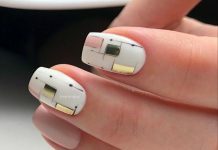 Gold nail polish pairs well with other colors hence such interesting pairings such as gold and white nails, and black and gold nails. Depending on the color of your outfit and accessories, check out your favorite gold combination and designs.